The theme of the August 2016 SGC Challenge is "Christmas in August" and the twist is to make something "Christmassy" using paper that isn't Christmas themed. For extra credit, we can make our own flowers and add some mixed media. At first glance, this photo of my granddaughter showing off her toothless gap doesn't seem to have anything to do with Christmas. But put it together with what I'll admit is one of the most annoying songs to be played during the holiday season - All I Want for Christmas (Is My Two Front Teeth) - and it's perfect! I started with a sheet of Bazzil cardstock in Walnut Cream and a very old stamp from the July 2011 Embellishment Add-On from Swirlydoos to create a bit of background for layers of distressed and inked Pion and Kaisercraft pattern papers from the July 2016 Moments Captured Main Kit. 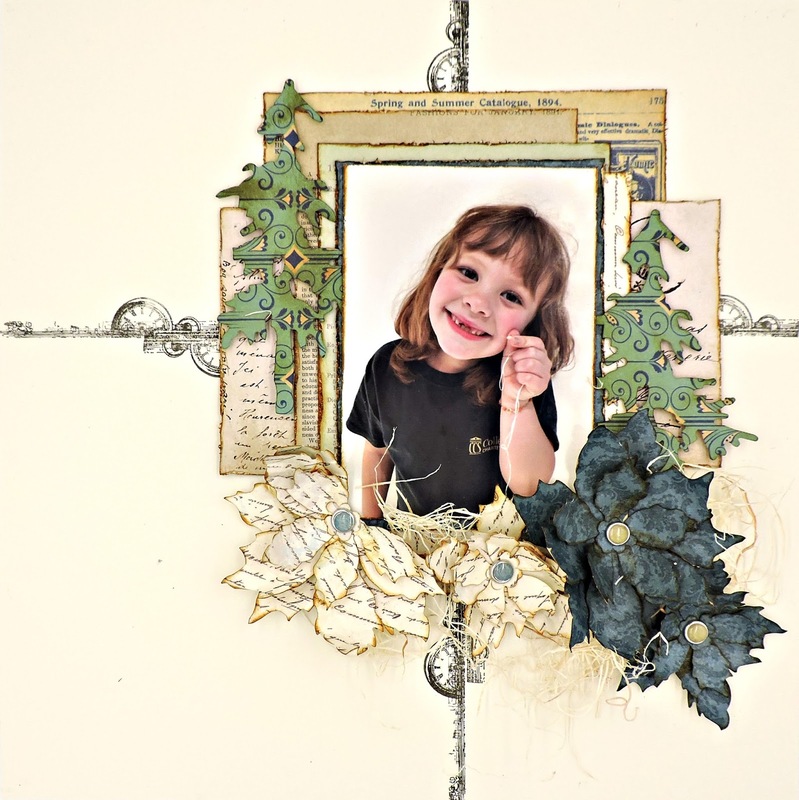 Next, I dug out some of my oldest dies - Pine Tree and Tattered Poinsettia Sizzix Bigz to create my flowers and a couple of borders for my photo. Once everything was layered and glued, I used some excelsior to fill in the gaps. That first tooth fell out on its own, but that stubborn second insisted on hanging in there. Mommy and Daddy decided to give it a push with the aid of a loop of dental floss, leaving Sophia with a big smile and visions of Tooth Fairy in her pretty head!! !